Last week we explored the medieval wonders at Moone, in County Kildare. 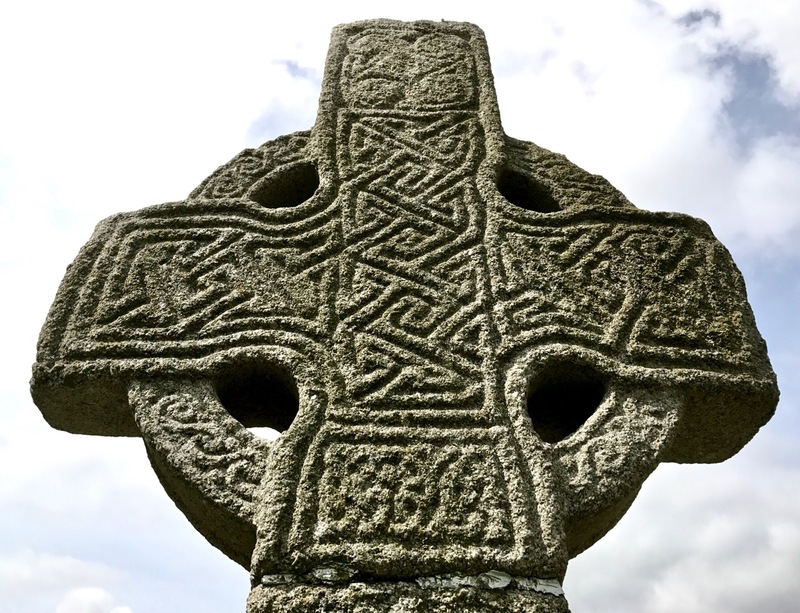 We couldn’t leave the area without going on to Castledermot to visit the monastic site of Díseart Diarmada, (the hermitage of Dermot) – a few minutes’ drive down the road. Stone carving artists were active here, too, as we can see from the many artefacts mainly centred today around St James’ Church, built on the site of the former monastery. These include a decorated Romanesque doorway: Finola is writing about Romanesque architecture today. The settlement itself was highly important. There were Viking raids during the 9th century, probably indicating that there was wealth to be plundered there. A royal grant was given for a fair in 1199, and the very first Irish parliament was convened in the town on 18th June 1264. In 1393 Castledermot was granted permission to mint its own coins. 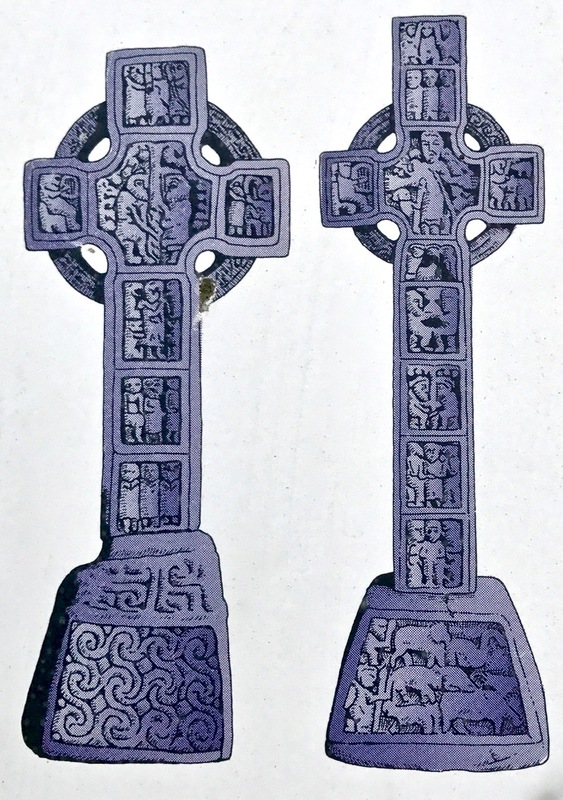 There are certainly figurative carvings on the two crosses to almost rival those found at Moone. I was particularly interested to see other versions of the stories of the loaves and fishes and Daniel in the lions’ den. But the real glory of Castledermot lies in the panels of knotwork. If these were coloured (as suggested at Moone) they must have been spectacular. It’s interesting to speculate who might have been responsible for this ancient carving. Could it have been the monks themselves, who considered that part of their dedicated life was to build and decorate the great monastic buildings? Or were they constructed by travelling masons, much as the later cathedrals were? And who directed and designed the work? These are such important monuments – a legacy which we must be sure to look after: they have been here for more than a thousand years and – in spite of being in the open and subject to constant weathering – are still clear to see. At Moone the great cross there has been placed under a modern protective canopy, which is not intrusive. Perhaps such actions should be considered for all these Irish medieval works of art. The site at Castledermot reveals many other remains which appear to be weathering quite badly. These include the Hogback Stone, which has been linked to Viking activity in the area: it was discovered just below the ground in its present location in 1967. 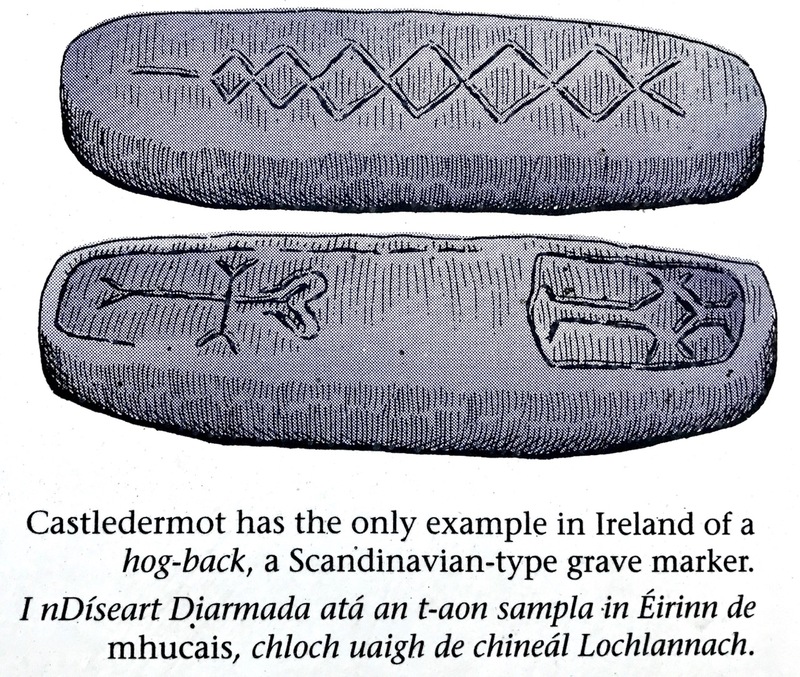 It is said to represent a House for the Dead, and other examples have been found in Scotland and England: this is the only one found so far in Ireland. Although residents in Castledermot are keen that their historic artefacts are well looked after and are seen by an interested public, the site remains rather obscure and perhaps deserves to be better known. There is a wealth of heritage in Ireland – do we take it too much for granted? The Office of Public Works (formally Dúchas) do their best to maintain and advertise the monuments under their care but it’s an uphill job with a budget which is far too small. We have by no means exhausted the treasures of this remarkable Irish town. 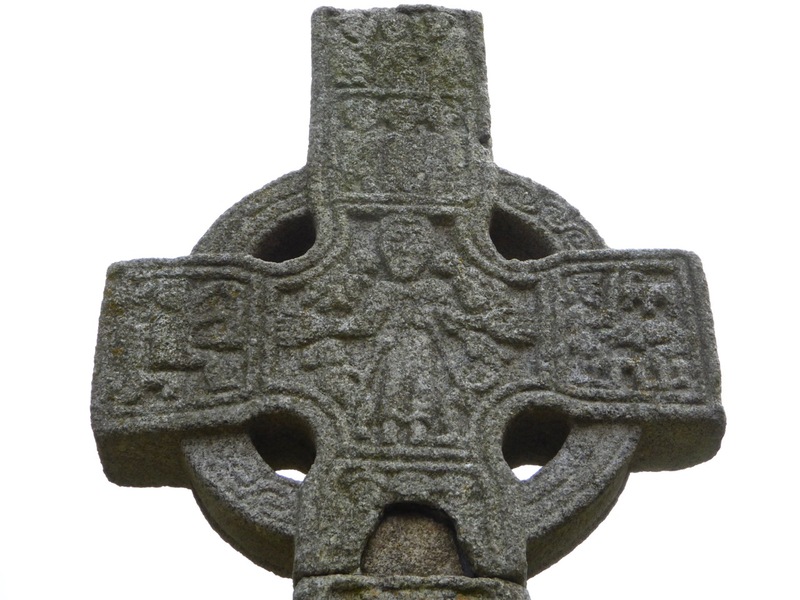 There are other intriguing carved stones and crosses on the monastic site, and, at the southern end of the town are impressive remains of a Franciscan Friary, founded around 1247. This site has a guardian and a key holder, but we didn’t have time to visit. Inside it is a rare cadaver grave stone dating to about 1520. In 1275, the town was given a royal murage grant. This allowed the collection of tolls from people entering Castledermot to pay for the construction and maintenance of town walls. The wall, with three gates, was completed around 1300.